When I re-started this blog almost three years ago (September 22), I never imagined what it would become for me. And I didn’t realize–until these last few months–how much I would miss it when life took me away for awhile. I would never have thought that blogging was so closely linked to my faith walk, but as the summer months pulled me away from the blog and out into the sunshine/pool/car/park/kitchen/zoo/lake/mall/library, I realized that my blog has become a gratitude journal of sorts, a place to stand before God and thank Him–with my words and my photographs–for the beautiful world and beautiful life that he has given me. The blog gives me a chance to pause and reflect. It puts perspective on the daily trials and helps me to realize that broken sleep and a messy kitchen should never take away my joy. Even real, deep tragedy like a profound illness, unemployment, injury, poverty, and death do not have to be the end of joy when your joy comes from God. This little spot on the internet gives me a chance to remember those things. And so…I’m now blogging for peace. To my own surprise, I’ve found that I need this space, this chance to be myself, stretch my creativity a bit, and ponder the goodness of life, in order to have peace in my mind and spirit. I had been forgetting to make time for such things, and the truth was revealed in my shortening patience, my negative “self-talk,” my discouragement, and a general sense of being down. Time to get back on track! Time for joy to take over. I just finished a post on windows (nyp 🙂 and the actual writing of it crystallized my thoughts and made it much more wonderful to think on. We need this writing bit, some of us, to help us understand and process… and I love the photo! Yes!! I so believe that for me blogging has become something entirely different, and ultimately essential, than I originally thought. I began it as a creative expression, and have learned that the creative expression is so very important to my sense of self, sense of calm, sense of gratitude! So glad you are back from the summer. Loved the picture. I realy love your blog, I don’t always get a chance to get on, but I do enjoy reading it and seeing the latest pictures of the family. 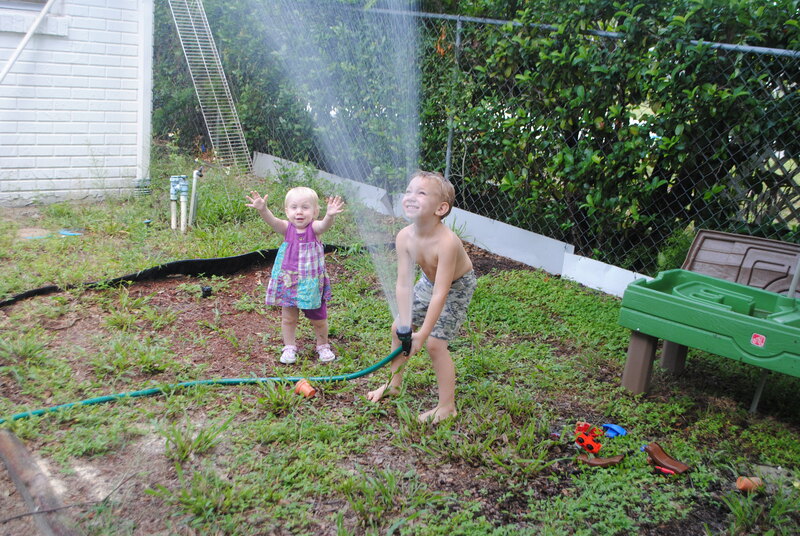 Remember, I NEED a copy of the “water sprinkler picture” Love you, Mom S.
Erica, I love your blog! It really keeps me inspired!